The event is designed for medical students and DiTs wanting to progress or even redefine their careers. It is your big chance to hear from expert panels and engage with up to 40 exhibitors and presenters, including health services, specialist colleges and training providers. 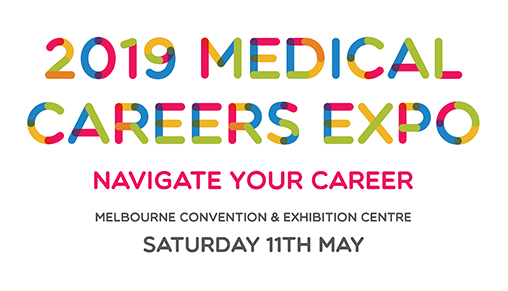 Get clarity and direction with the largest range of potential employers and medical career collaborators under one roof. There will be a number of major metropolitan and regional health services in attendance, including Royal Melbourne Hospital, Austin Health, Western Health, Eastern Health, Ballarat, Bendigo, and Peninsula Health. If you want to speak to or hear from representatives of the major specialist colleges, we have you covered. In attendance will be RACGP, RACS, RACP, ANZCA, RANZCP, ACEM and RCPA. Training providers will include the Victorian Palliative Medicine Training Program, James Cook University College of Medicine and Dentistry, GP Training Victoria and Postgraduate Medical Council Victoria. Expect many more exciting announcements on attendees, speakers and expert panelists! A full list of attending colleges and health services can be veiwed in the drop down menu below. The professional body representing sport and exercise physicians and sport and exercise medicine in Australasia. The ACSEP is dedicated to providing a robust training experience for its registrars whilst advancing the skills of its members. The professional medical college of over 17,000 physicians and 8,000 trainee physicians in Australia and New Zealand. Australia’s largest professional general practice organisation represents urban and rural general practitioners. The RACGP's mission is to improve the health and wellbeing of all people in Australia by supporting GPs, general practice registrars and medical students. The professional organisation for specialist anaesthetists and anaesthetists in training. One of Australasia's largest specialist medical colleges, it is responsible for the training, examination and specialist accreditation of anaesthetists and pain medicine specialists. A non-profit organisation training surgeons and maintaining surgical standards in Australia and New Zealand. Surgeons are doctors who have completed further training in a surgical specialty, recognised by the regulatory authorities of AMC, MCNZ, and AHPRA. Responsible for educating and representing psychiatrists in Australia and New Zealand. Psychiatrists are medical doctors who are specialists in the treatment of mental illness. The organisation responsible for training emergency physicians and advancing professional standards in emergency medicine in Australia and New Zealand. Aims to support pathologists and improve the use of pathology testing to achieve better healthcare. Pathologists are the specialist medical doctors involved in the diagnosis and monitoring almost of all acute and chronic illnesses. WHICH HEALTH SERVICES ARE GOING? RMH is one of Melbourne’s preeminent hospitals. It provides specialist, general acute and subacute health services across two campuses. RMH is part of Melbourne Health, which includes North Western Mental Health and The Doherty Institute for Infection and Immunity – which includes the Victorian Infectious Diseases Reference Laboratory. Austin Health is the major provider of tertiary health services, health professional education and research in the North East of Melbourne. Austin Health is world renowned for its research and specialist work in many fields of medicine and provides state wide services in liver transplantation, spinal cord injuries, respiratory support services, toxicology and paediatric mental health. We are also the centre for Veteran mental health services. Eastern Health is one of Melbourne’s largest metropolitan health services. They provide a range of Emergency, Medical, Surgical, Mental Health, Women’s and Children’s services to Melbourne’s eastern community. Interns, HMO’s & Registrars rotate to Eastern Epworth, Bairnsdale Regional Health Services and Latrobe Regional Hospital. Eastern Health is aligned with Greater South Eastern Consortia for Physician Training. This includes Eastern Health, Monash Health, Warragul and Traralgon Hospitals. Western Health is the largest tertiary health service in the west of Melbourne, serving a diverse community extending from Footscray to the growth corridors of Caroline Springs, Melton, Sunbury, Werribee and beyond. Western Health manages three acute public hospitals: Footscray Hospital at Footscray; Sunshine Hospital at St Albans; and the Williamstown Hospital. Peninsula Health is the major health care provider serving the metropolitan and rural areas on Victoria’s Mornington Peninsula. The Health Service has a full range of acute medical and surgical services. There are accredited Registrar positions in Pathology, Emergency Medicine, Intensive Care, Aged Care, O&G, Physician training, Palliative Care, Psychiatry, Paediatrics, Surgery and Rehabilitation. Northern Health is the major provider of acute, sub-acute and ambulatory specialist services in Melbourne's north. Across campuses they provide a range of primary, secondary and some tertiary health care services. The emergency department (the busiest in the State) treats over 85,000 patients each year and we delivered over 3,580 babies last year. Albury Wodonga Health (AWH) is the regional referral hospital for North East Victoria and Southern New South Wales, comprising 280 beds over two acute sites 10 kilometres apart. Health Services includes a 9 bed Intensive Care Unit, 7 Operating Theatres and two Emergency Departments. Inpatient services include general medicine, ICU, paediatrics, obstetrics & gynaecology, general surgery, orthopaedics, urology, ENT, ophthalmology, psychiatry, medical oncology, geriatrics and rehabilitation. BRHS provides health care services to the East Gippsland community. Placements represent an opportunity to experience rural medicine, working alongside general practitioners, visiting and staff specialists within a community focused hospital. Bendigo Health is the regional referral and trauma centre for a region that extends from Woodend to southern NSW and is committed to delivering world class healthcare to the community. There is emphasis on a practical, hands on approach to junior doctor training and the aim is to foster excellent clinical exposure across a range of specialties. The Hospital is situated in the City of Shepparton and serves as the Base Hospital to a region including the Goulburn Valley and extending over the border into New South Wales. Services include a 24-hour Emergency Department, Surgery, Medical Services, Women’s and Children’s Services, Rehabilitation and Palliative Care, Mental Health, Outpatients, services at Tatura and Rushworth. Ballarat Health Services is the major provider of hospital and healthcare services in Western Victoria, an area of 48,000 square kilometres. Ballarat Health Services provides excellent hospital training and experience, superb rural lifestyle and exciting career options. Echuca Regional Health is a public hospital located just 200 kilometres north of Melbourne, providing a comprehensive range of services including emergency, medical, surgical, sub-acute, maternity, paediatric, urology, orthopaedic, ophthalmology, dental, chemotherapy and haemodialysis services. With a strong focus on increasing capacity as an outer regional health service, Echuca Regional Health directly recruits junior medical staff and receives doctors on secondment from Austin Healthand Bendigo Health. The Northeast Health Wangaratta facility is a modern 228 bed hospital providing emergency and elective clinical services for the Central Hume Region. It is a designated Regional Trauma Service. The Emergency Department at NHW is the only 24 hour emergency medical facility between Melbourne and Albury-Wodonga and last year provided care to over 24,000 patient presentations.